How to Survive Irish Gameday! It’s football season again. This phrase incites emotion in everyone who doesn’t live under a rock; whether it be excitement for the best part of the year, nostalgia about some of the most iconic memories with friends and family, or even dread about losing control of the TV (and Saturdays in general) to your dad, brother, or friends for months on end. For a student at the University of Notre Dame, the reaction is the same, if not magnified by 20. It’s iconic, legendary, and a plus for anyone considering the school (even those who don’t particularly understand or appreciate the details of football, like myself!). Of course, if you’re a student at Notre Dame, you are already well aware of this. At the end of last week, campus (and all of South Bend) was stormed by an insane amount of people. College Gameday chose to station at Notre Dame and by Thursday morning they were already all set up in front of Touchdown Jesus. As soon as classes were over on Friday, the excitement was bound to boil over and all anyone could think of was what the next day would bring. Regardless of the outcome of the game, it was a legendary day, and certainly an overwhelming one. After September 1, you surely understand why this post is necessary. 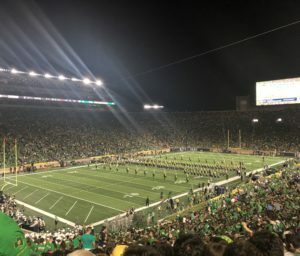 There is a right and a wrong way to do Irish gameday; there were already some casualties on Saturday, and I hope you weren’t one of them! As an incoming freshman, I didn’t understand what gameday was all about. I had heard that there were always tailgates to go to, that the games themselves were magical, and that it’s an all-day ordeal. I found this all to be true. Gameday starts at 8 in the morning for those who are especially daring—I am not, but I still make it a goal to be out of my room by 10 a.m. The usual routine is to go off-campus to a boys dorm house for what is commonly called Kegs and Eggs, and sometimes there will literally be a full breakfast sitting out for the taking! However, seeing as boys are gross and unorganized, counting on this would be foolish. The most important rule of a good gameday is that it starts before you reach the party. It is essential that you eat a good breakfast before you do anything. I recommend an Einstein’s breakfast sandwich—not only is it delectable, but did you know they deliver?! Another essential part of your morning routine is water, and with that water, vitamins and supplements. This is an important part of every day, and taking them can help give you the stamina and nutrients necessary to withstand the most taxing of gamedays. A few of my favorites are my general multivitamin, my hair and nail vitamins, a vitamin D supplement (crucial for this California girl when Indiana lacks sunshine for months on end—more on that later! ), and my tumeric supplement. Although it’s not one of the first supplements that comes to mind, you’ve probably had turmeric in foods, and you probably aren’t aware of its extensive benefits. I encourage you to visit the link provided to learn why I swear by it. Regardless, armed with your bagel, water, and vitamins, you’re ready to cheer on your team. So you’ve had an energetic morning or day of parties, tailgates, friends, and family, now what? It’s time for the actual game! Make sure you’re in the stadium in time to sing along to “Here Come the Irish” and watch the team storm the field. It’s incredibly emotional and gives me goosebumps every time. If you’re a freshman, make it a goal to sit in the seats right behind the band at least once. While occasionally deafening, the excitement is magnified with the sound and the proximity to the field. Stay for the entire game while it’s still warm out! I made the mistake of leaving the initial games early and then was unable to stay for the entirety of the later ones because it got too cold. n’t be afraid to sit out the cheers and take a break, and chug something from concessions like a Powerade; in the cold, hot chocolate is essential and the heaters in the bathrooms make it an absolute sanctuary. Onto the topic of food and drinks, they don’t tell you that you get a student discount. Even though it’s clear that you’re a student, they will try to charge you full price unless you show your ID. We pay far too much for tuition to lose another dollar to this school. Lastly, enjoy these moments. Although I’m only a sophomore, I’m absolutely dreading the time when I won’t be able to cheer on my Irish every weekend. Utilize the tips I’ve included here, and you too will be marching onward to victory!